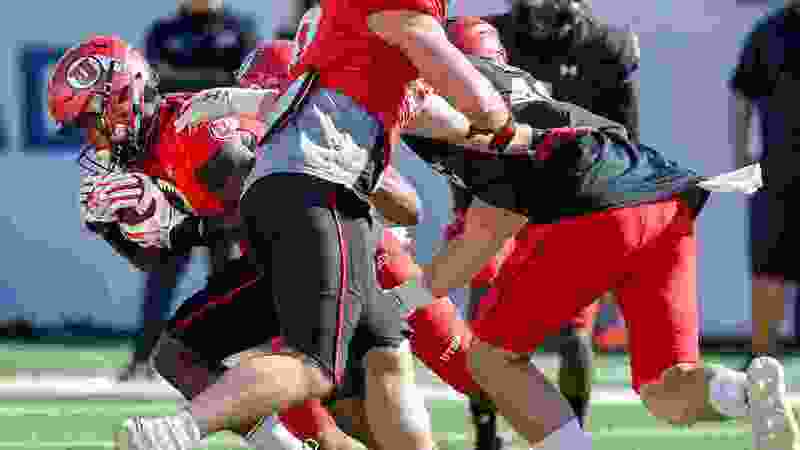 (Francisco Kjolseth | The Salt Lake Tribune) Devonta'e Henry-Cole, #7, pushes past the defense as the Utah Utes hold their first of two major scrimmages of spring practice at Rice Eccles stadium on Saturday, March 30, 2019, prior to the April 13 Red-White Game. Utah running back Devonta’e Henry-Cole took a handoff, bounced to the outside and ran for 10 yards to begin the Utes’ second major scrimmage of spring football practice Friday at Rice-Eccles Stadium. That first play of the day produced a bigger gain than any of the first-team offense’s basic runs last weekend, when the No. 1 defensive line dominated the No. 1 offensive line. The return from injury of tackle Nick Ford and a better overall performance by the linemen made the session more encouraging for offensive coordinator Andy Ludwig. The scrimmage consisted of 94 plays, considerably more than last weekend. The event marked the last live work for most front-line players this spring. About one-third of the starters will participate in next Saturday’s Red-White Game, coach Kyle Whittingham said, and they’ll play only about half of the game. The Utes will have “physical practices” Tuesday and Thursday, Whittingham said. First-team offensive players were not tackled to the ground Friday — the same format as in the first scrimmage, in an effort to keep everybody healthy. With the quick whistles preventing any tackle-breaking opportunities, Henry-Cole’s statistics were modest. He was able to show an initial burst, though, unlike last weekend when the defensive linemen stuffed nearly every up-the-middle run. Henry-Cole is the No. 1 back this spring, with Zack Moss rehabilitating his knee. TJ Green ran 45 yards for a touchdown with the No. 2 offense and caught a 26-yard pass from Jason Shelley. Transfer quarterback Cameron Rising took some snaps with the No. 2 offense Friday and ran twice for 37 yards on zone-read option plays, including a 17-yard touchdown. Starting quarterback Tyler Huntley ran for an 8-yard score. All four quarterbacks were efficient, with only a few long passes attempted. The last play of the day was an exception, with Drew Lisk hitting Jaylen Dixon down the middle for a 32-yard touchdown. Huntley looked sharp in two-minute drill and finished 10 of 16 for 93 yards. His unofficial two-scrimmage totals are 20 of 28 for 191 yards, with one interception. Lisk was 5 of 6 for 93 yards Friday, Shelley was 4 of 8 for 51 yards and Rising was 2 of 3 for 17 yards. The biggest disappointment for the offense came in the scripted red-zone portion of the scrimmage, as the defense usually forced field goals. “Not efficient enough. … We’ll get that tightened up,” Ludwig said. The offense didn’t have any turnovers, though. That means the defense didn’t force any takeaways, summarizing the nature of spring football. Otherwise, defensive coordinator Morgan Scalley again was satisfied with the work of his No. 1 group. In the ongoing place-kicking competition, Chayden Johnston may have moved back in front. He made field goals of 39, 25 and 37 yards. Jadon Redding hit from 25 and 29 yards, but missed from 42 and 44 yards. The standards are high in a program that has produced a series of stars in those roles. The specialists are gradually “looking more like we’re used to,” Whittingham said.